Saul Leiter photo exhibition, Bryant Park/42nd Street subway station, New York, installation photograph © 2007 John Barnes. 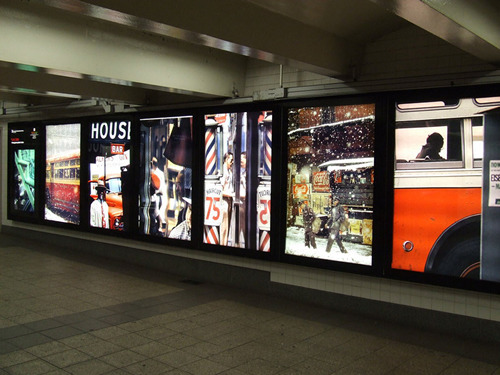 A welcome break from the usual underground commercial advertisements, the MTA Arts for Transit program produces rotating photography exhibits in lightbox panels at several subway stations in the city, including the Bryant Park/42nd Street stop. Look out for the current exhibition next time you hop off the train on your way to the park.